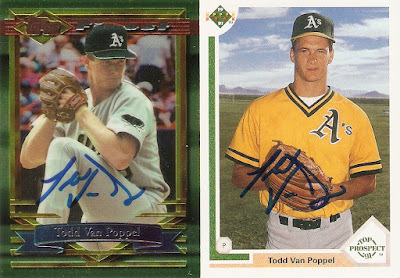 When my friend Darrell at Halkman sports announced he would be doing a private signing with former Major Leaguer Todd Van Poppel, I knew I had to get involved with that one. 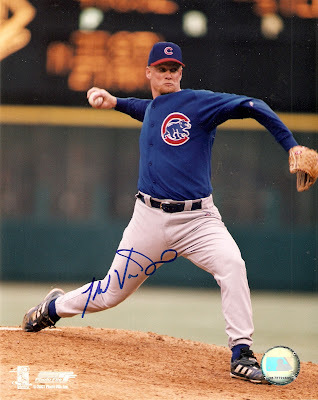 Since he was a Cub for a short time, I wanted an 8x10 of him in his Cubs gear, and I also decided to get a couple cards signed, as well. I remember back in the early '90s, Van Poppel was one of the first major baseball prospects I remember from when I began collecting. His career may not have quite went in the direction that people thought it would, but he stuck around for a few years. Of course, in getting cards, I had to get some done that were pretty big at the time: his rookie card, and his Topps Finest card.